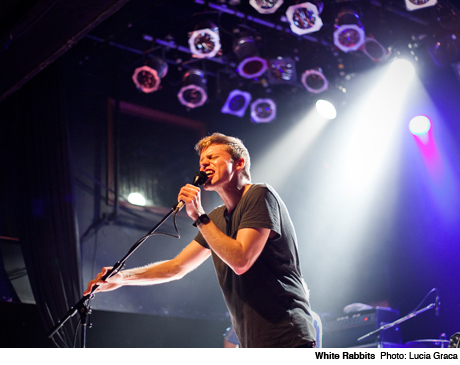 Like a limbo-dance champion, White Rabbits love the low end. Arming a secondary percussionist with floor toms and free rein, every track from the Brooklyn-via-Missouri six-piece had an inherent gravitas (axiom: speak softly, carry a big stick... hit things hard with the latter). Leadoff "Temporary" began forebodingly, holding the rhythm section in reserve as it creeped into a stirring, anguished racket on the back of an incisive guitar. "Are You Free" was all heavy pounding, which wisely sacrificed nuance in favour of sheer bombast. Conversely, "The Day You Won the War" had singer/pianist Stephen Patterson balancing out a danceable groove and Albert Hammond, Jr. guitar line with twinkling keys and shots of falsetto. Sophisticated and unrelentingly grand, it was a rousing set from a deft, assured band.